David Heiblim knows a thing or two about comfort food. He’s the founder of both Este Pizzeria – specializing in East Coast-style pizzas – and Este Deli, which offers East Coast-style sandwiches and other deli fare. So it might come as no surprise that the main attraction at his newest restaurant is one of the ultimate comfort foods: pot pie. It’s the type of food you’d expect to find at classic American diners and family restaurants. But make no mistake: The Dispensary isn’t your daddy’s diner. Not by a long shot. When Heiblim first described the vision for his new eatery to me last year, it sounded more like a philosophy of life than a restaurant concept. It was a little hard for me to get my head around. But now, seeing his vision fully realized and up-close, I think I get it. You see, The Dispensary is driven by much more than profit motive. The menu states “10 Principles” that govern the way business is done at Heiblim’s Dispensary, and the ways in which he and his staff are committed to community values. Some of them could be found in any number of restaurants. The commitment to organic and local foods, for example, or doing business in an environmentally responsible manner, including striving for zero waste, recycling, and donating unused foods and such. But some of the principles driving The Dispensary are far less common. No tipping is necessary (or even allowed) because Heiblim pays his employees a “living wage,” saying “We pay our staff a living wage so they can live a life they love.” That’s rare in the restaurant world. 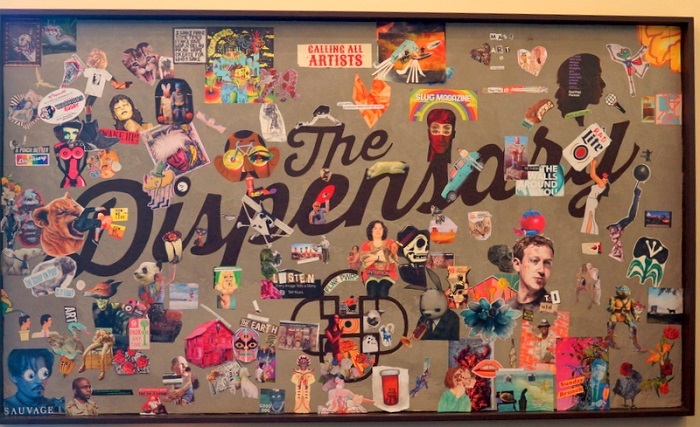 And, so is the spirit of collaboration that is part of The Dispensary business plan. Heiblim and his staff actually collaborate (as compared to compete) with other restaurants to develop menu and retail items for The Dispensary. For example, the current menu includes a house soda with Lebanese syrup and a special pot pie brimming with chickpeas and eggplant, both courtesy of Laziz Kitchen. Heiblim plans to team with cooks and chefs from Finca, Takashi and other local eating establishments for future collaborative endeavours. The point of such collaborations is, in part, to shine a light on other significant restaurants in our community, not just on The Dispensary. Kudos for that. It’s probably natural to think of places like Cracker Barrel or Marie Callender’s when the idea of pot pie arises. Well, think again. Because pies at The Dispensary are a whole different animal. There are two pie categories here: classic (and not-so-classic) pot pies and hand pies. The hand pies are smallish, sweet or savory pies similar to empanadas or Jamaican patties, and they vary in ingredients and cost depending on what’s fresh and in season. Pot pies are the main draw and, although a pot pie might seem like a wintery food, it’s just as satisfying in summer. (After all, we eat all sorts of other hot foods in warm weather, right?) 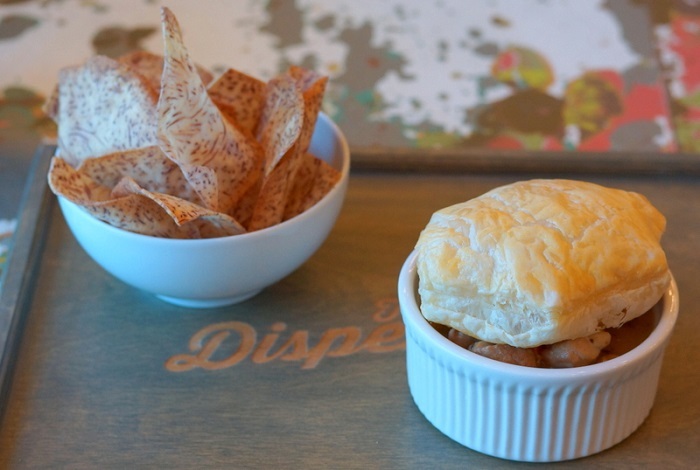 Well, any season is the right season for the excellent chicken pot pie ($12) at The Dispensary. Each pot pie is offered with a choice of topping, or no topping if that’s your preference. Classic pot pie devotees (like me) can opt for a traditional puff pastry topping. But there’s also a Clifford Farm fried egg topping as well as a thick, gluten-free cracker-type topping made from almond flour and cricket flour. Yep, it’s made from real crickets and is super-high in protein. My wife threatened to take a bite out of my hand if I reached for her almond-cricket pie topping, which she loved every bit as much as the filling. My chicken pot pie had a flaky phyllo crust and, although the terrine it came in looked small, it’s deceptive: I couldn’t finish the entire pot pie. It was brimming with chunks of Mary’s Chicken in a thick bone broth sauce with carrots and other veggies, thickened with arrowroot, and flavored with hints of thyme. A serving of thin-sliced taro chips fried in coconut oil and dusted with house salt was a perfect side dish. Other sides include sauteed greens (chard, kale, onions, garlic, sunflower seeds and coconut oil) or a crisp fennel salad with julienned fresh fennel, kale, preserved lemons, herbs and sherry vinaigrette. Side are $3 for a half-size portion or $6 for full-size. 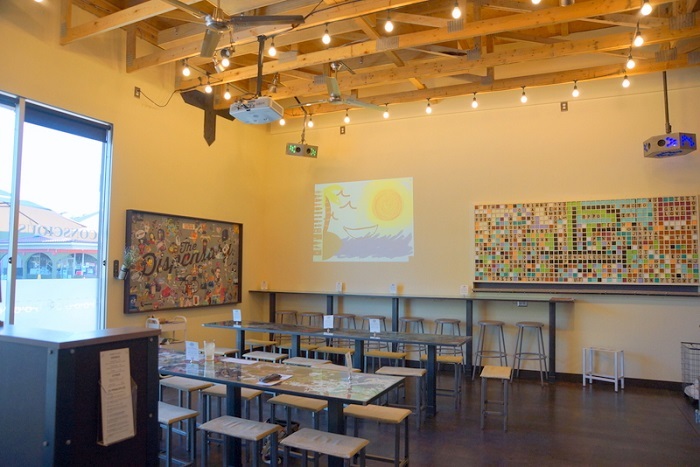 One of the most innovative aspects of The Dispensary – where virtually everything is innovative – is that Heiblim wants customers to participate in his eatery, not just be a “guest.” Of course, it’s perfectly fine if your preference is just to eat and run. But there are invitations to participate in this eatery literally built into the walls. 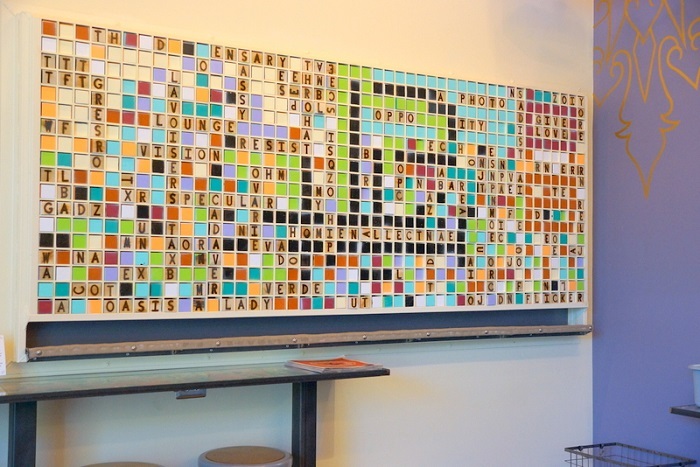 It’s an interactive environment with art on the walls that invite customers to create, invent, scribble and indulge, whether via a clever Scrabble-type word wall, using iPads on the tables, or perhaps cutting and pasting from magazines laying around the restaurant onto a “Calling All Artists” board. As Heiblim puts it, “This is a place to play and take a risk.” So, it’s an adult (although kids will love it, too) playground of sorts. McDonald’s has those playgrounds for kids; The Dispensary invites its customers to play and create, as well. 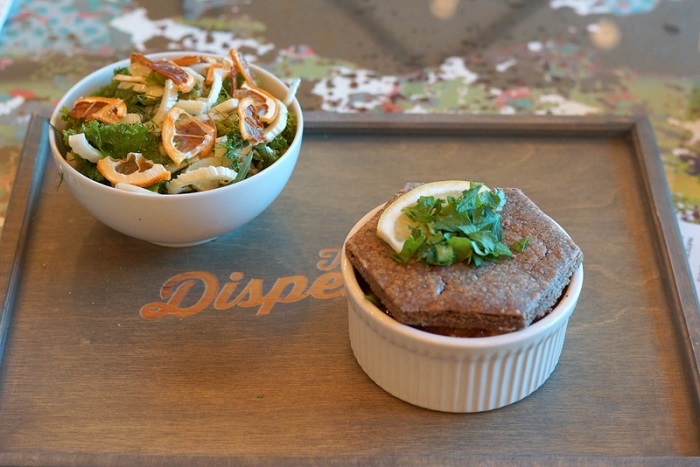 In the heading for this article, I used the term “conscious dining.” That’s because I think this is precisely what is going on at The Dispensary: conscious dining. It’s not formal dining by any means. There are no white tablecloths or wine goblets to be found. But even the plates and utensils serve a conscious purpose. You’ll find no styrofoam, paper or plastic here. Meals are served on real ceramic plates with real knives, forks and spoons (metal ones) and real (cloth) napkins. They are meant to be washed and reused – part of the restaurant’s “zero waste” policy. No paper is wasted in taking orders, which are handled via iPads. Place an order with your iPad helper, pick it up at the station with the sign saying “Your Time Has Come,” and when you’re all done, drop your dishes and such off at the “Happy Ending” station. Waste not; want not. When I asked Dave Heiblim if The Dispensary was built upon a model of other restaurants somewhere else, he said no, that it really came to him as – and I’m paraphrasing here – an idea about how a restaurant could really serve as part of a living, breathing community – both a resource and a business dedicated to environmentally sound practices, wholesome foods, local needs, and a collaborative spirit. The last on the list of his 10 Principles is “Community.” Think of us as a resource for our community, he states. To me, it’s an invitation to conscious dining, and one I hope we’ll all flock to. After all, conscious dining can also be delicious.